Having grown up in a Mexican household my idea of thanksgiving was always a little different from a typical holiday meal. Our “intimate” family dinner involves 3 to 4 families and in total it would be about 20 or more people. We usually use two dinner tables and eat in shifts so everyone can sit and enjoy the meal. Our spread consists of the traditional turkey, potatoes, stuffing and casseroles, but to this add pork stewed in chile colorado, chiles rellenos, tortillas, rice and beans. For dessert: pumpkin pie and sweet potato casserole alongside flan and gelatina de leche. This year, while I did miss my family very much, I was also very fortunate to have spent Thanksgiving with Drew’s family. It was a complete change to what I was used to: dinner for five, everyone eating together and a more traditional midwestern dinner complete with turkey, mashed potatoes, stuffing, pumpkin pie and other sides like jell-o salad and sweet potato casserole. Throughout the day I had the pleasure of working with Drew’s mom in the kitchen, showing off some of my holiday cooking chops while learning a few new recipes and stories along the way. As we had the honor of hosting dinner, I took charge of handling the turkey, gravy and potatoes while assisting with the other side dishes. I also prepared what I called a reverse pumpkin pie which basically consists of a creme brulee with pumpkin mousse. For the turkey I prepared a compound butter of rosemary, thyme, parsley, garlic, pepper and orange zest. Using a food processor I made sure all the ingredients were finely chopped, using a bit of olive oil to help the ingredients along. I added this mixture to a softened stick of butter and rubbed all over the turkey, making sure to get some butter under the skin of the breast as well. I then proceeded to stuff the turkey with orange, lemon, thyme, rosemary, garlic cloves, white onion and a couple of bay leaves. I wanted to get enough flavor and moisture going through the bird as possible. Drew’s mom brought with her a clay roaster that she has used for various years. The roaster is first soaked in water, then turkey is placed in the base and covered before going into the oven. This was my first time using a clay roaster and I must say the results are quite amazing. There is no need to even open the oven door for the entire cooking time; it just cooks in the roaster. The meat comes out moist and the skin is perfectly browned. 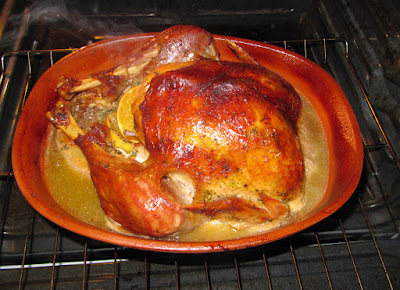 I utilized the drippings from the roaster along with some chicken broth to put together the gravy. I simmered the broth and drippings in a sauce pan while I prepared a roux using a bit of flour and a few tablespoons of turkey fat. I added the roux to the liquid and heated until it thickened. To prepare the potatoes I simply boiled russet potatoes and mashed with heavy cream, butter and salt. There were various side dishes that we ate along with dinner. 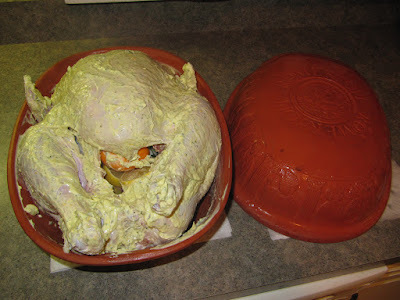 We had stuffing which was bread crumbs mixed with celery poultry seasoning and a bit of chicken broth, then baked through. The sweet potato casserole was a delicious mix of sweet potatoes, eggs, brown sugar and cream that was baked in the oven. 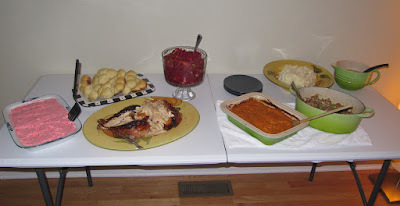 We also had a cranberry salad which went well with the turkey and a creamy cherry jell-o salad with fruit. For dessert I prepared a reverse pumpkin pie. I must give the credit for this one to Drew and his undying love of creme brulee. The idea here is that what would normally be vanilla whipped cream is our pie while the pumpkin filling is actually our whipped cream. 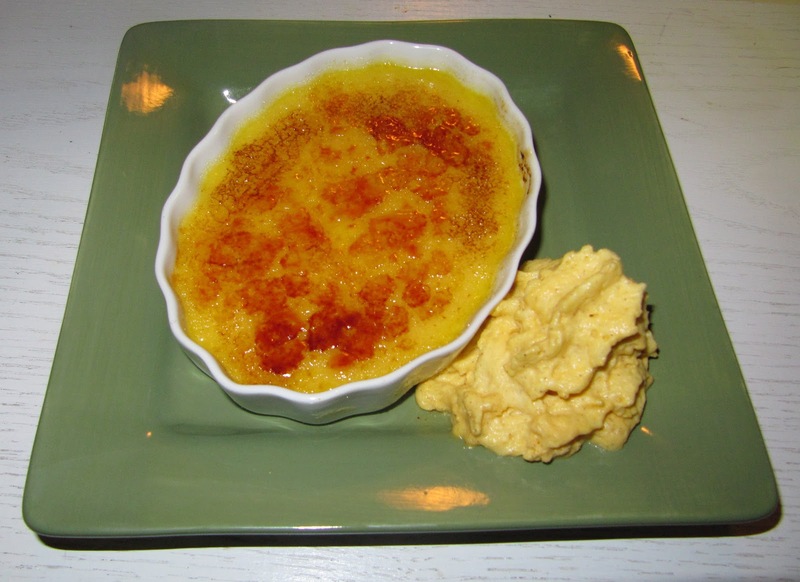 The vanilla creme brulee portion serves as our base or pie with burnt sugar as the crust. To top the dessert I prepared a pumpkin flavored mousse that would serve as the whipped cream topping. The creme brulee was a mix of heavy cream, egg yolks, sugar and vanilla, baked then chilled. To prepare the whipped cream I combined half and half, pureed pumpkin, cinnamon, nutmeg and sugar. I chilled this mixture and used the ISI machine to create a mousse. Right before serving I sprinkled sugar on the creme brulee and used a torch to form the crust. I served a healthy portion of pumpkin mousse on the side and dessert was served. Our small group of five had a big meal and my initial culture shock was soon eased with lots of laughter, conversation, and food. I was glad the turkey was enjoyed by all and that the meal overall went over so well. As we went around the table we expressed what we were most thankful for, I shared that I was thankful for Drew and the opportunity for us to be together for the first time with his family on such a special day. I hope everyone had a great thanksgiving, and if you have any memories of this year’s dinner that you’d like to share, I would love to hear about it!